My mother recently reminded me of an interesting phenomenon happening in many Bulgarian towns in the 1950s and ‘60. It was called “dvizhenie,” which literally translates into “movement,” but means strolling or walking back and forth along a street or other public space. She remembers the main street in the small town she was born in, and how during “dvizhenie” traffic always gave way to the movement of pedestrians. There’s nothing complicated about people strolling in a leisurely fashion, but what is impressive is that “dvizhenie” was a community ritual of special importance. This was the occasion for socializing; everyone dressed in their best clothes (as an expression of respect to fellow citizens), meeting and greeting friends, exchanging pleasantries and the latest news. The strolling was not only a way to spend some time outdoors among neighbors and friends, meeting new acquaintances, but was also a recognition of the significance of socializing. This was socializing for its own sake. It happened not because of some practical purpose, and didn’t involve deliberate networking or the sharing of precious information. It was a simple, informal, unhurried human interaction. One cannot but notice today, especially in the US, the lack of such purposeless interaction. The conventional wisdom is that we need to line our streets with shops, restaurants, sitting areas, or markets if we want to have a lively street. At a minimum we need strong anchors on both sides of any pedestrian activity, similar to the mall with its department stores at each end. However, “strolling” as an expression of civic life has historically happened in spaces that are not always centered on consumption or entertainment. The pleasure is in the act of movement and socializing and being part of a common experience. More often than not the public spaces where strolling happens are scenic, whether they are parks, streets or plazas. Think of the Tuileries Garden in Paris, the Triple Bridge designed by Joze Plecnik in Ljubljana, the Ringstrasse in Vienna, or Charles Bridge in Prague, among the most famous places for pedestrian movement. However, in the Bulgarian version of “dvizhenie” a modest street lined with houses and the occasional coffee shop or a store served the purpose as successfully. The main point was the interaction and the ritual; its setting was secondary. The strolling was a tradition for local residents, who engaged in it on a regular basis, usually on a Saturday, a logical day for leisure time in good company. The beauty of this phenomenon is that being in close proximity with other humans was a purpose in itself. Is it something we crave today? And where can we satisfy such a need in today’s sprawling landscape? It seems that in suburbia the interior of the enclosed mall provides the best stage for strolling; there is not only shopping, but plenty of socializing, too. (Teenagers meet their friends there, seniors go there for exercise, mothers bring their toddlers for play-dates.) But the mall’s extinction has started; it has outlived its former glory as an economic generator, and is slowly exiting the stage through demolitions, retrofits, or even abandonment. Can the physical repair of the mall and its surroundings create the dynamics for strolling and social interaction? It certainly can if we look at the number of malls being transformed in successful urban centers around the country. 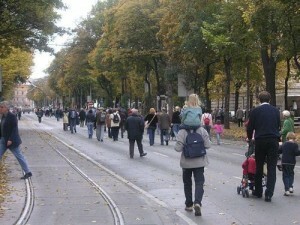 But perhaps we can invent simpler ways to provide space for strolling. Sprawling suburbia is so lacking of human-scale public realm that mere designation of a space and small incremental gestures may suffice to allure strollers. The interventions can be as symbolic as providing a few flowerpots and chairs to temporarily close streets, transforming a few parking spaces into mini parks, and taking on one block at a time. At first sight such modest urban tactics may look like scratching the surface of the larger problem of fixing sprawl, but they have already been successful in provoking desire for more permanent urbanity where it is most needed.